When we hear words like, “Chanel” or “Dior” most thoughts run straight to thousand dollar handbags. What if you could display these beautiful logos proudly, for a tad less damage to your wallet? Many of these luxury brands have a line of adorable costume jewelry. Don’t expect to pay dollar prices, but a dazzling pair of Chanel earrings certainly costs less than the $3,500 bag. Dior has a dazzling pair of heart-shaped hoop earrings featuring the Dior logo in silver. Covered in Swarovski crystals, these thick hoops will definitely turn heads. At just $270, they are certainly more affordable than the newest leather handbag. 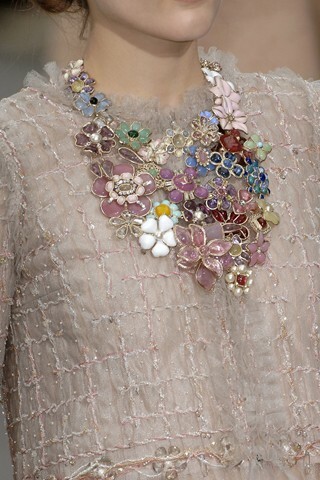 As for Chanel, there is a necklace that was seen on the runway featuring a large cluster of flowers in colorful pastels including pinks, blues and greens with gold trim. This piece is more elaborate and probably a bit more pricey, but how fabulous! I know I would wear it nearly every day. So if you are feeling itchy from not having that new designer bag, why not ease the pain with an amazing piece of costume jewelry? Believe me, your wardrobe will thank you and you won’t know what to do with all of the compliments!